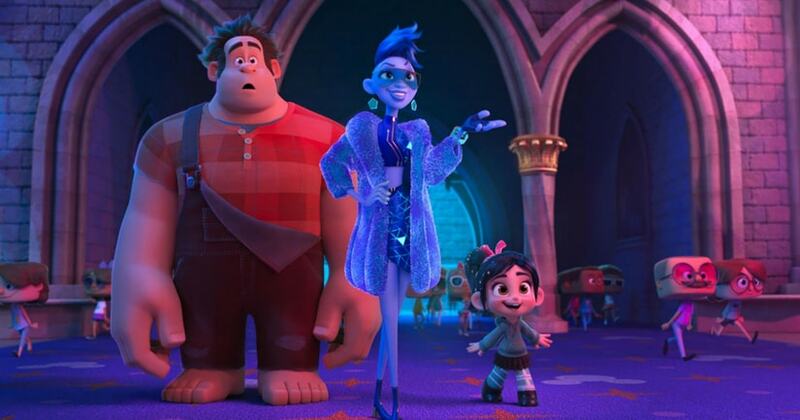 If you’re on the lookout for another round of top level pop culture filled animation, a bag of genuine laughs and your heartstrings to be pulled just a little bit, Ralph Breaks the Internet is the film to watch this weekend. This is an atypical sequel that is just as effective as the original but one that doesn’t feel like a cash grab despite repeating the narrative formula. A still from Ralph Breaks the Internet/Image from YouTube. Much like the gap between the two films, six years have passed and now Ralph (John C. Reilly) and Vanellope (Sarah Silverman) are inseparable gaming buddies. Things take a turn when they’re forced to visit a strange thing called ebay dot com and therefore the big bad lands of the Internet. The web naturally seduces Vanellope and she finds her dream come true with a car game run by Shank (Gal Gadot). Ralph, on the other hand, chances across an opportunity to make some money with the magic of viral videos. The interweb setting of the film makes for a fairy large canvas, though the filmmakers (Rich Moore, Phil Johnson) only settle for a handful of opportunities to be mined for laughs. Since there is a brand value gimmick attached to the narrative – a smart ploy previously seen with the Lego universe films – we get the expected nose dives into pop culture cameo moments. It would take a truly experienced entertainment geek to identify all of the Easter eggs but even if you don’t, it’s easy to be swept away by the manic energy of the film. The film moves at a breakneck pace almost to a fault, slavishly catering to the internet-addict-attention-deficit young crowd, a parallel where the irony was probably not intended. The comedy is uniformly dispersed to keep things bouncy, the highlight of which is an extended moment that skewers Disney princess clichés and their regressive origins. There are a few heavy themes like the dynamics of a controlling friendship that the film deftly navigates without seeming like a life lesson. You’re also treated to some contemporary internet catch phrases like the dark web and click bait, even though their treatment and exploration are merely surface level. Seen in 2D, the visuals are jaw dropping, and the visual device of seeing the ‘inside’ of the internet from the point of view of video game characters is as wild and chaotic as you expect it to be. Don’t expect the vast reserves of imagination from Inside Out, however, because the internet isn’t nearly as mysterious as the human brain. The world building is fun, however, with the narrative containing more than a few similarities to Zootopia which was made by the same filmmaking team.